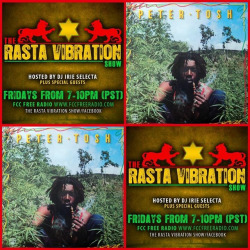 Be sure and tune inn to The Rasta Vibration Show tonight!!! We have a pair of tickets to see Sanchez at New Karibbean City next friday Jan 18th and Nuff reggae music to jump start your friday night!!! Tune inn with your hosts General Patton & Irie Selecta worldwide 7-10pm(pst) on www.fccfreeradio.com Studio 1A!!! Tell a friend!! !